WARlord (formerly known as ServletValidator) is a static program analyzer for Java Servlets, JSP, and Struts. The analysis consists of a front-end that computes a context-free grammar that captures the possible output of the given servlet (i.e. string fragments printed to the output stream) and a back-end that analyzes the grammar for XML well-formedness and XHTML validity as well as HTML validity. Furthermore it has a back end that statically checks for client-state manipulation vulnerabilities. View the online javadoc API specifications. 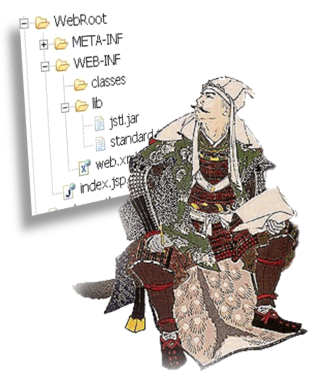 where base_directory is the location of the application, jsp_directory is the relative location of where the JSP files are stored and webxml_location is the relative location of the web.xml file of the application. where class is the name of the class to analyze and method is the name of the start method in the class (for example "doGet"). Note that the tool will need the application classes to be in the classpath too. The WARlord package is implemented by Mathias Schwarz at Aarhus University. Copyright © 2008-2013 Department of Computer Science, Aarhus University. Please send comments to amoeller@cs.au.dk.